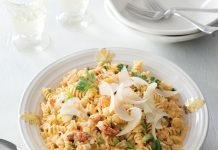 Since shrimp are so easy to cook, they work perfectly in all kinds of dishes, especially during the warm months of spring and summer. 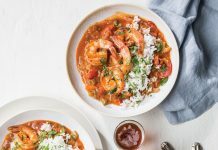 Here, we pickled tender Louisiana shrimp to highlight their sweet flavor and served them with a blend of red quinoa and couscous for some additional protein and fiber. With minimal cooking time and a punch of citrus flavor, this grain salad is a keeper you’ll come back to again and again. Fill a large bowl with ice and water to create an ice bath. Set aside. Fill a large Dutch oven or stockpot halfway full with water. Add Creole seasoning and 1 teaspoon salt, and bring to a boil over medium-high heat. Add shrimp; cook until just pink, 2 to 3 minutes. Drain shrimp. Immediately transfer to ice water bath to stop the cooking process. Drain shrimp. 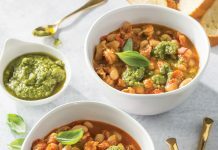 In a medium bowl, whisk together vinegar, oil, peppercorns, mustard seeds, sugar, red pepper, and remaining ½ teaspoon salt. In a large resealable plastic bag, combine shrimp, fennel, shallot, garlic, lemon slices, dill, and vinegar mixture. Seal bag, and refrigerate for at least 8 hours, turning occasionally. 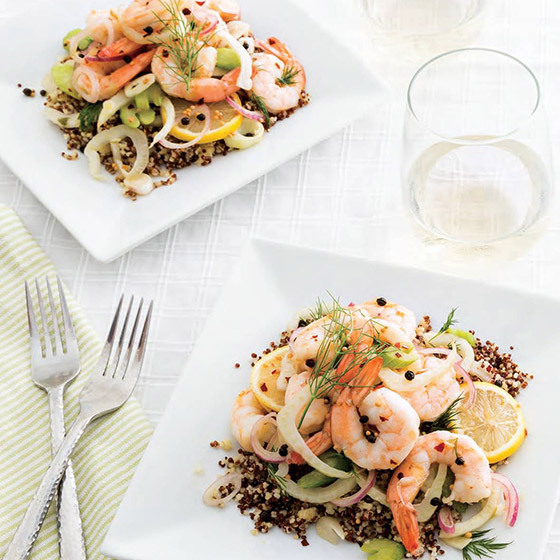 Serve shrimp over a scoop of Red Quinoa and Couscous Salad. Garnish with fennel fronds, if desired. In a large saucepan, bring 1 cup water to a boil over medium-high heat. Add quinoa; reduce heat to medium-low. Cover and simmer until quinoa is tender and water has been absorbed, 15 to 20 minutes. In another large saucepan, bring remaining 1½ cups water to a boil over medium-high heat. Add couscous; remove from heat. Cover and let stand until couscous is just tender and water has been absorbed, 5 to 7 minutes. In a large bowl, combine quinoa and couscous. Add oil, lemon juice, and salt, stirring to combine.